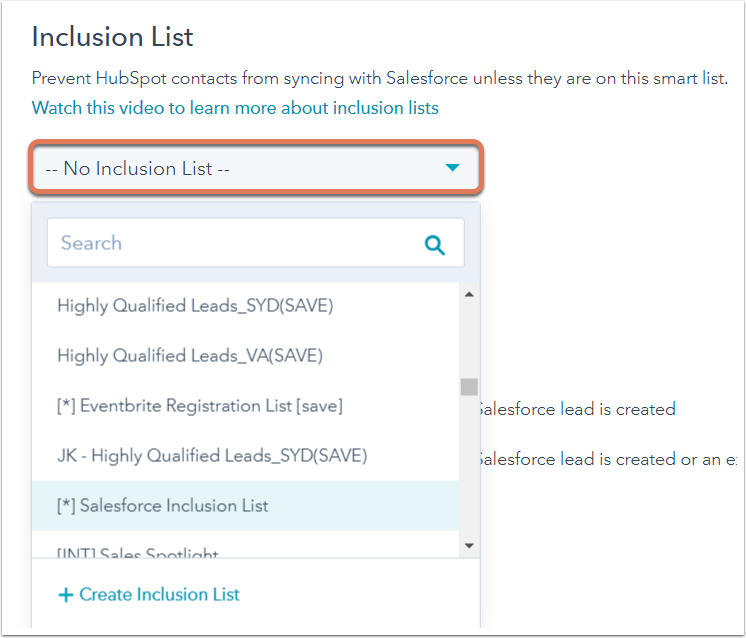 In the HubSpot-Salesforce integration, you can create and use an inclusion list to limit the contacts that sync from HubSpot to Salesforce. Contacts that are not in your inclusion list will not sync from HubSpot to Salesforce. In the Inclusion List setting, click the dropdown menu and select an existing active list. To create a new active list, click + Create Inclusion List. If you select an existing active list, the setting will update automatically. If you click + Create Inclusion List, you'll be redirected to create a new list in the lists tool. In the top left, click the pencil icon edit and enter a name for the list, then select your list criteria. Learn more about determining your list criteria. Return to your Salesforce integration settings. In the Inclusion List setting, click the dropdown menu and select the newly-created active list. The setting will update automatically. Only active lists can be set as your Salesforce inclusion list, as they will update dynamically as contacts meet or don't meet your list criteria. If new or existing Salesforce leads/contacts that are updated are set to automatically create HubSpot contacts, but some of these new HubSpot contacts don't meet your inclusion list criteria, they will not sync with Salesforce again until they meet the inclusion list criteria. Selecting a list as your inclusion list will not automatically sync the list with Salesforce. Members of the inclusion list will only sync with Salesforce when a sync is triggered. Learn how to manually resync a list with Salesforce.